Mounting numbers of buy-side firms seek to explore the trade surveillance technology market. Boston, July 25, 2017 – Buy-side firms are developing increasing demand for more sophisticated trade surveillance solutions. Many firms in this global segment have not yet discovered the trade surveillance technology that will best suit their needs. What are the functional requirements, regulatory drivers, and structural trade surveillance pain points of buy-side trade surveillance? This Impact Report is based primarily on 15 qualitative interviews with senior-level buy-side compliance personnel conducted by Aite Group, and sponsored by Nasdaq, in Q1 2017. 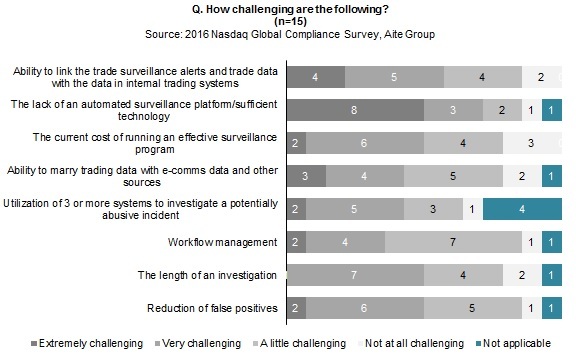 Also referenced are data collected from the second annual quantitative Global Compliance Survey executed by Nasdaq and Aite Group in 2016. This 28-page Impact Report contains 20 figures. Clients of Aite Group’s Institutional Securities & Investments service can download this report, the corresponding charts, and the Executive Impact Deck.